Phyllis Johnson Olsen Gibson, 92, passed away March 25, 2010 at Atria Assisted Living Center in Sandy, Utah from congestive heart failure. 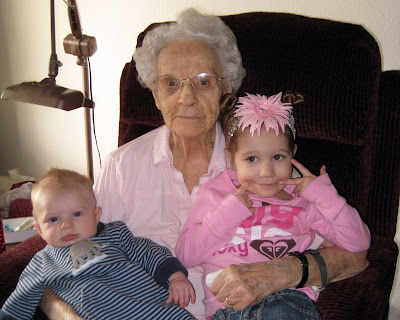 She was born October 30, 1917, in Hatch, Idaho, to Frederick and Estella Simons Johnson. She married her sweetheart, Harley George Olsen on December 6, 1939 in the Salt Lake Temple. They were married 34 years before Harley passed away on February 26, 1973. They raised four children, three daughters and one son. Phyllis was a member of The Church of Jesus Christ of Latter-day Saints where she served in many music and leadership callings. An accomplished soloist, Phyllis also enjoyed music, crocheting, needlework, gardening, and reading. Grandma Gibson with great-grandchildren Christian and Ava—February 3, 2010. She loved her children, grandchildren, and great-grandchildren and spent many happy hours with them. Phyllis was an active member in the Daughters of Utah Pioneers, Grace Literary Club, and the LPN Organization. She worked for many years at the Caribou County Memorial Hospital. She married William Doris Gibson on November 15, 1979. They were married for 26 years before Doris passed away on April 15, 2005. Phyllis is survived by three of her children, Sherrie (Duane) Rubink, Helen (Joe) Harris, and Fredrick (Kristy) Olsen; 19 grandchildren; 42 great-grandchildren; and one sister, JoMarie Smith. Preceded in death by her other siblings, daughter Louette (Doug) Trotter, and grandson Jed Olsen. Thanks for writing a sweet tribute. You Furr's are always so thoughtful. I hadn't realized that she and Grandpa Harley had been married for so long before he passed away. I'd like to know what he is like! I'm so sorry to hear of your loss. She looks like a wonderful lady and it sounds like she led a very full, happy life. 42 great-grand-children: That is quite the legacy to leave. It makes you realize the difference one person can make. We're thinking of you and hope the next few days bring sweet peace of fond memories. What a beautiful tribute. P.S. Greg's grandfather was in the same care facility just a few years ago. We visited several times and it is a very nice place. I'm sorry Krista:( what a great tribute and sweet pictures to remember her by!!! Thinking of you!! So sorry to hear of your loss. You are so thoughtful to document all of your family's lives all the time.